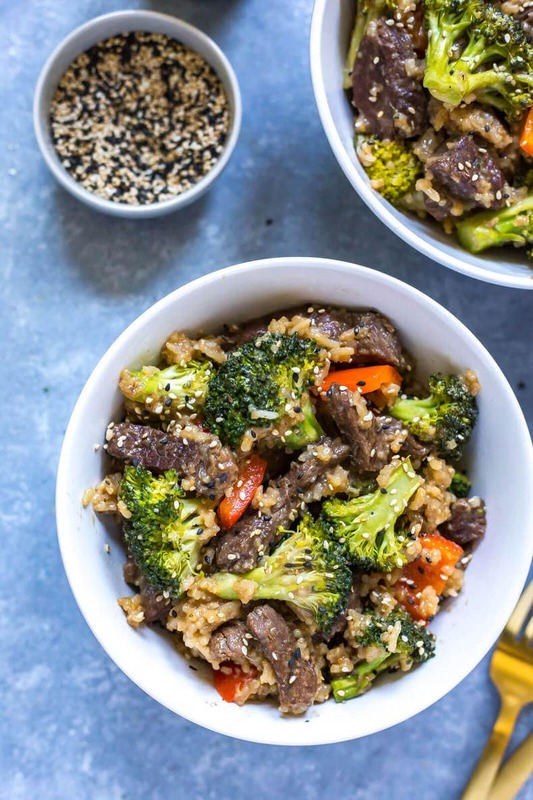 This Instant Pot Beef and Broccoli with Rice is a filling takeout-inspired 30-minute dinner idea that comes together with pantry staples and in one pot – it's an easy alternative to the stir fry method! I'm back with another delicious Instant Pot recipe, and this time it's another takeout fakeout recipe! Ever had beef and broccoli at your local Chinese restaurant? Yep, I know, it's amazing right?? 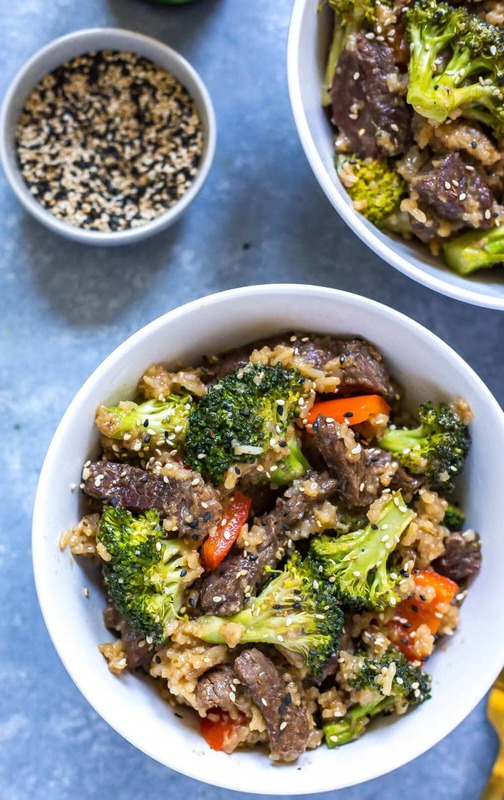 Tender chunks of beef, and fresh crunchy broccoli that's cooked just right in a savory ginger-soy sauce that is also loaded with garlic. I could eat this stuff everyday if I was trying to limit my consumption of red meat. Don't worry, I still eat beef a couple times a week so I'm not one of *those people* but I do try to stick more to plant-based options, chicken and seafood during the work week. 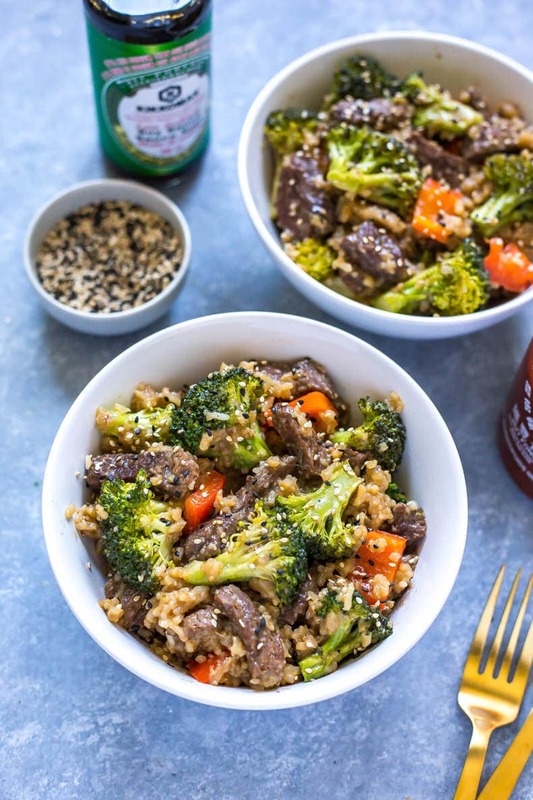 But I'll make an exception for these beef and broccoli bowls, because they're actually pretty healthy. And they come together in ONE POT, did I mention that part? I love simple dump dinners like this. You literally dump everything into your Instant Pot, then set it and forget it. 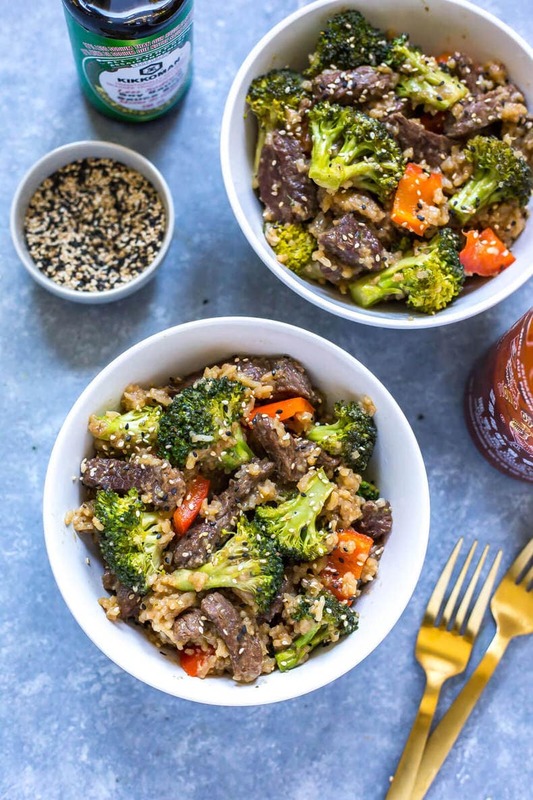 Of course you don't cook the broccoli or red peppers, you're basically doing the beef and rice first along with the sauce, but when you stir them into the hot mixture afterwards you're left with veggies that have almost been steam cooked. They're just tender enough but still have a bit of a bite to them. 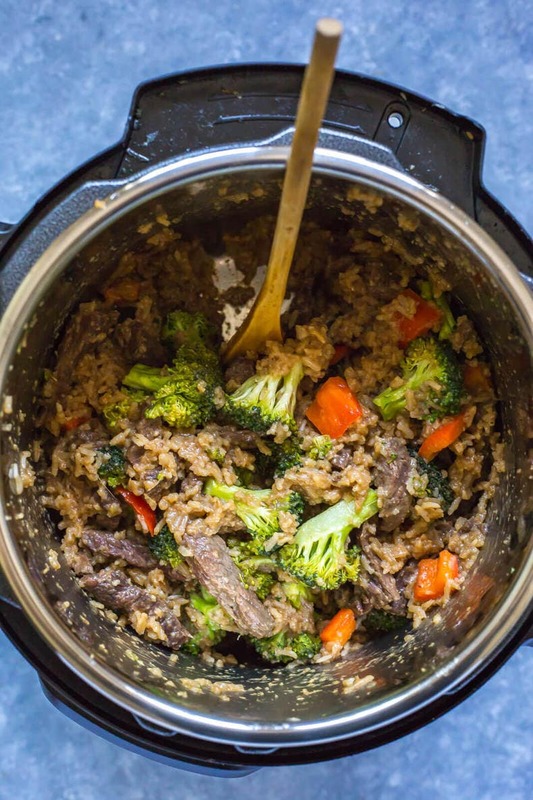 If you like your broccoli a little more well-done, I still wouldn't necessarily recommend pressure cooking it – instead, try cutting it into smaller pieces and then letting it sit a little bit longer with the hot beef and rice and that should do the trick! 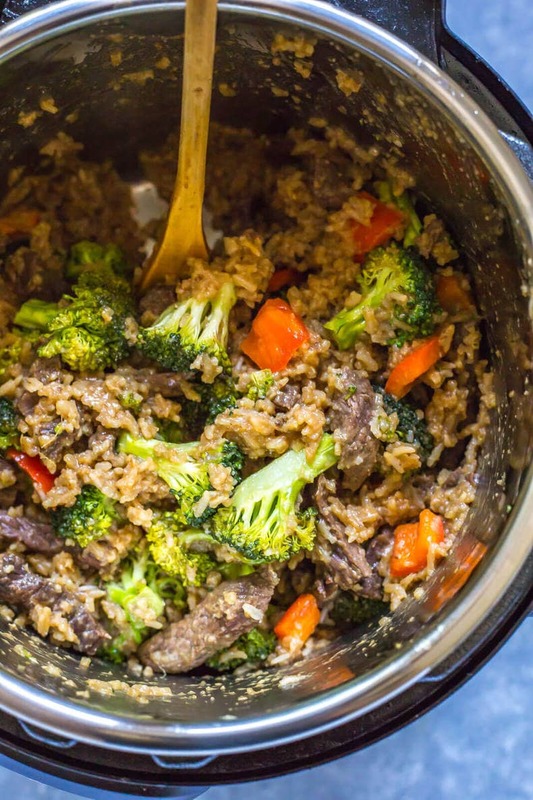 With your typical beef broccoli recipe, you're looking at making a thicker sauce using cornstarch and water but I've switched it up a little to make it Instant Pot-friendly. You could probably even do the beef in the slow cooker for 4 hours on high or 6-8 hours on low and then add in some cooked rice after the fact, but in the interests of saving time I'd prefer to stick to the Instant Pot. 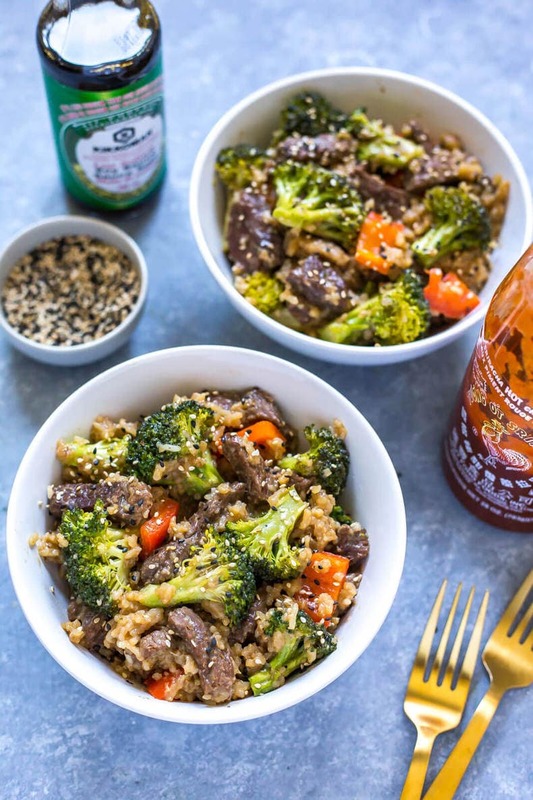 Literally the sauce is just soy sauce, garlic, ginger, hoisin sauce and water – they're all pantry staples that you should already have on hand at home, and this flavour combo is pretty much my go-to when making any sort of Asian-style cuisine. If you like your stir fries a bit on the spicier side, you could also try adding a bit of sriracha or chili garlic sauce for a bit more flavour too but otherwise this is a super easy and straightforward sauce and there's not mixing anything together separately either. Just dump it all in one by one in the Instant Pot! 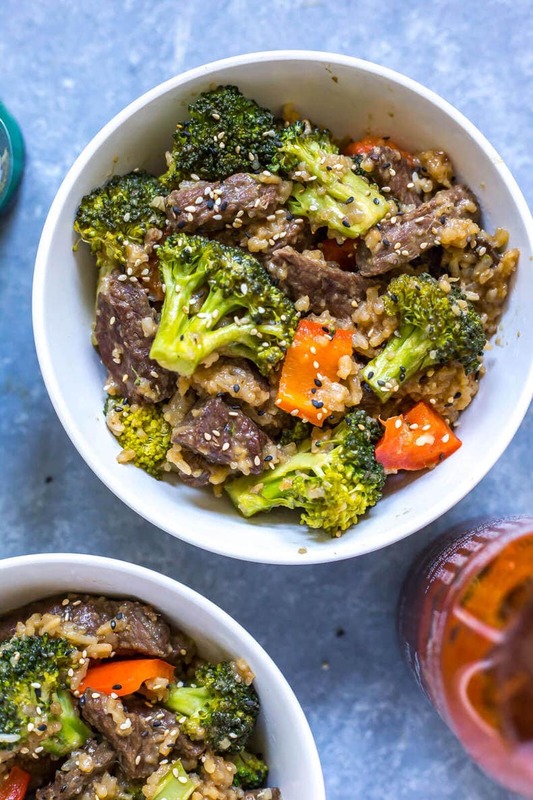 I also really love to make this beef with broccoli into meal prep bowls because you can cook a huge batch at once. 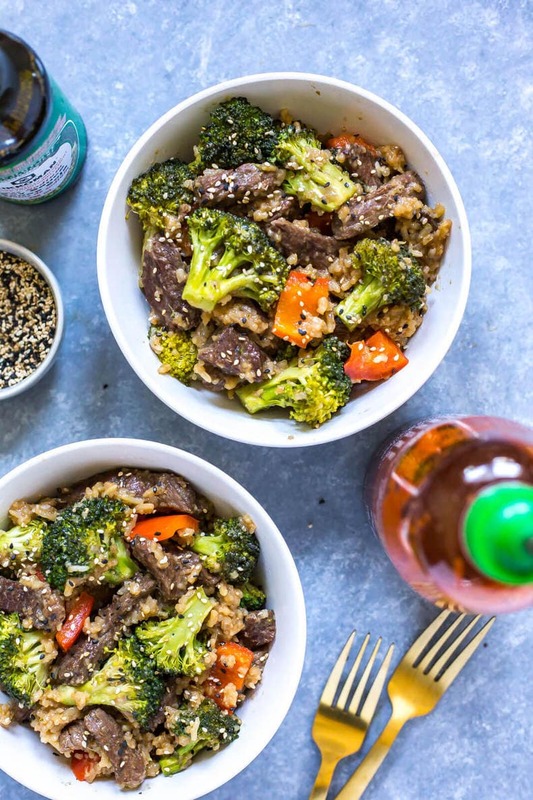 If you aren't cooking for family and it's just you that you have to worry about, you may want to ensure that you have enough to eat during the work week and that's where this delicious stir fry copy cat comes in! You could even technically make this with chicken and it would still taste pretty good if you're concerned about eating red meat each day of the week. Either way, you're gonna LOVE the sauce in these bowls! 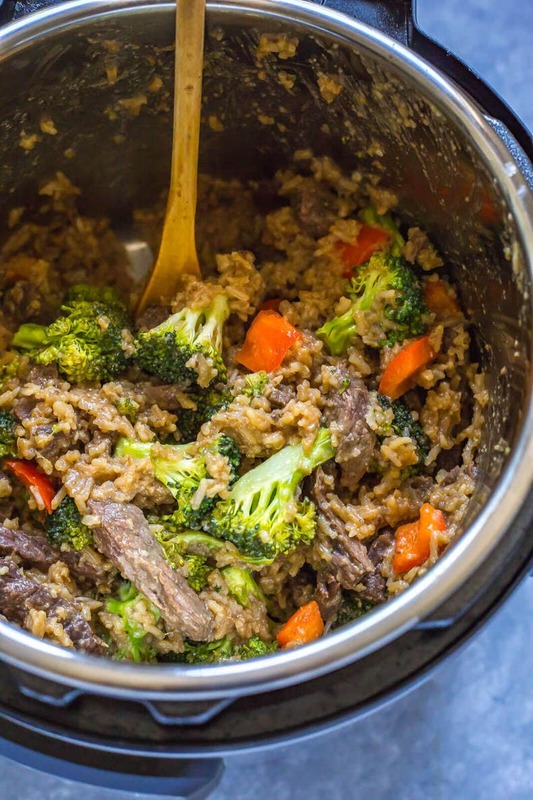 Will you be making this Instant Pot Beef and Broccoli? 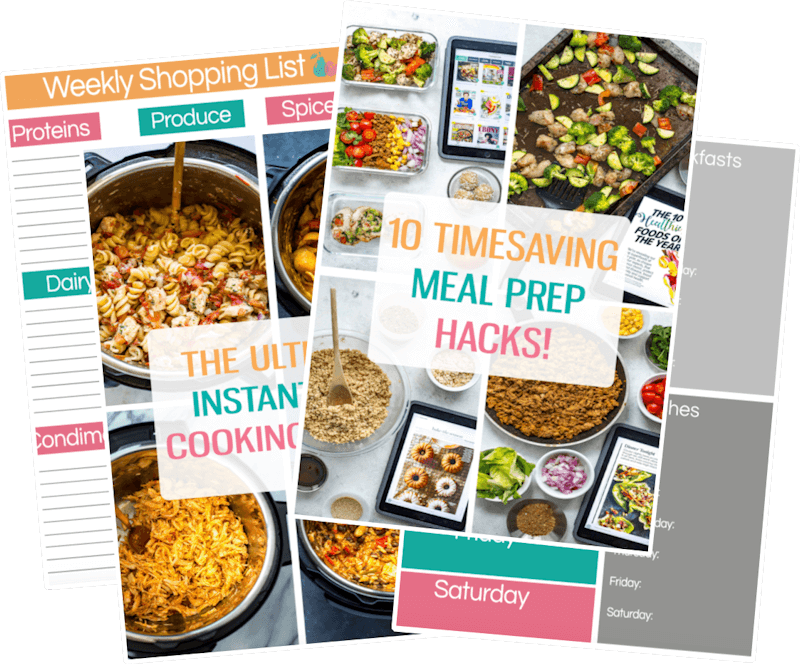 This is one of my fave go-to meal prep ideas – pretty much anything done in the Instant Pot is a MAJOR time saver for me! I get grass-fed beef from my monthly Butcher Box – it's a great way to enjoy healthier meats and poultry and they're even offering 2 free ribeyes and bacon! 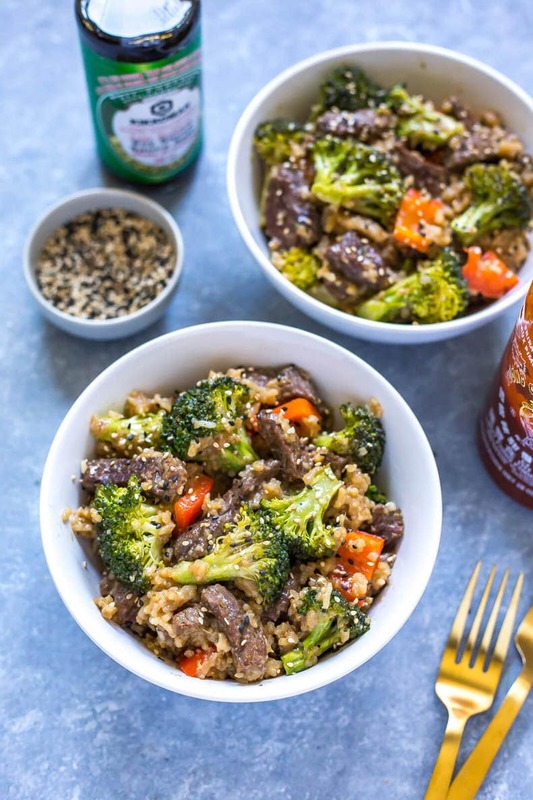 This Instant Pot Beef and Broccoli with Rice is a filling takeout-inspired 30-minute dinner idea that comes together with pantry staples and in one pot - it's an easy alternative to the stir fry method! Add olive oil, steak strips, garlic, ginger, soy sauce, hoisin sauce, water and rice to Instant Pot in that order. Cook on high pressure for 4 minutes. Instant Pot will take about 10-15 minutes to come to pressure, then pressure cook the 4 minutes so overall cooking time is closer to 20 minutes. Do a quick release of the pressure and open the lid when it's safe to do so. Add in broccoli and red pepper, stirring to combine well. Place lid back on Instant Pot and let sit for 5-10 minutes to let the vegetables steam. Serve with a bit of sesame seeds on top and enjoy! In this recipe is it cooked or uncooked rice? I used uncooked rice and it wasn’t cooked by the time the beef was. Then when I put more time in, it burned. Any tips? Hey Deb – sometimes it depends on the way everything was layered in and letting the rice mixture sit an extra 5-10 minutes allows for extra liquid to absorb. Sometimes it also depends on the brand of rice strangely enough. I rarely advise cooking extra because any time you stir something and cook more you are not allowing any air pockets that are needed for the pot to pressurize fully if that makes sense. Sorry to hear you had trouble! Hi there, I’m new to your website and really enjoying looking through your IP recipes. I’m trying to combine the freezer cooking method with IP and would like to know whether you have any experience with sticking these same ingredients frozen in the IP? I’m wondering how much I would need to adjust the 4 min cooking time you mention. Thanks for the help! I want to put the rice in a separate bowl on top of a trivet. How much water would I need to put in the pot since I’m making the rice on top of everything separately? Hey Tara – unfortunately I don’t have experience doing this and it’s a very substantial change to the recipe so I could not tell you. Sorry about that! Can this be made with farro or quinoa? 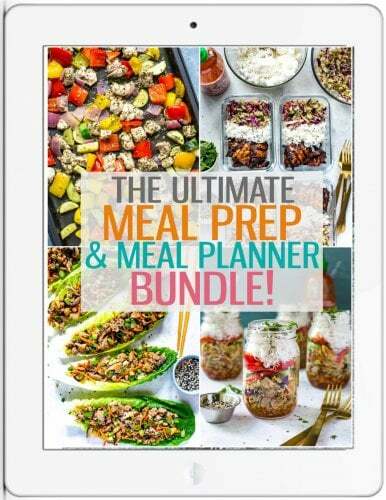 You could try quinoa although I cannot guarantee results since I haven’t tried it myself! I just tried this recipe with brown rice and the rice was not cooked at all. Any tips? Hey Michaela…this recipe is not meant to be used with brown rice, it takes much longer to cook. Did you follow the recipe exactly? Wondering if you have a different sized Instant Pot or used different rice or cook time. There should be no extra liquid especially after sitting for an extra 5-10 minutes. When the broccoli and peppers are added am I to press “steam” or just put lid back on and the stream from the bed and rice will cook it?